At Groundwater Lift Trucks Ltd, our service team provides customers with the assurance of the highest degree of forklift truck reliability with the minimum of costly downtime. 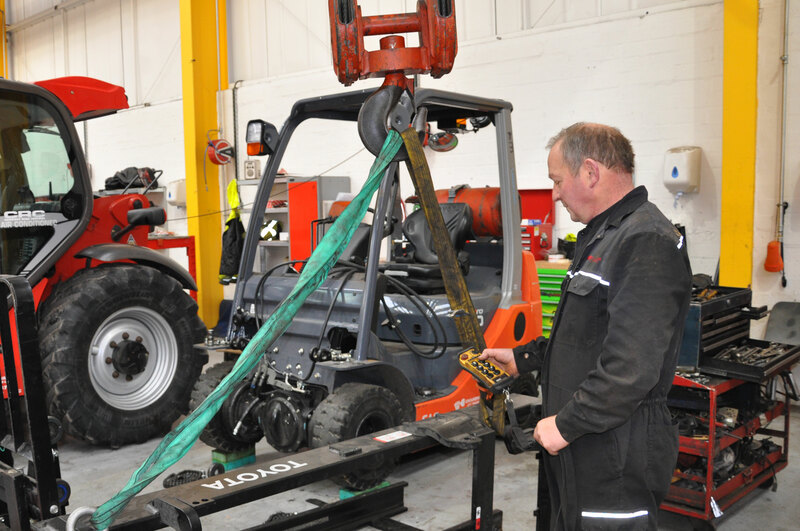 Our Service department has the expertise and facilities required to ensure that our customer’s forklifts remain in excellent working order, working to their fullest potential. Downtime is kept to a minimum by our large fleet of mobile engineers, along with our workshop based engineers, who are trained to manufacturer standards. We have a fully equipped workshop where we can carry out repairs, major overhauls, refurbishments, etc. All our engineer’s vans are fitted with the latest tracker technology and the engineer’s jobs are sent to them electronically. This allows us to be on site within our 4 hour response time and complete the repair. Our engineers cover Aberdeenshire, Angus, Fife, Perthshire, Dundee and beyond if requested. As members of the FLTA (Fork Lift Truck Association) we are always looking at ways in which we can keep you and all operators safe whilst operating machinery. The link below will give you access to all the technical and safety information that you need. If you require any further information on this please do not hesitate to pick up the phone or email us. Groundwater Lift Trucks Ltd has trained engineers who can carry out Thorough Examinations in accordance with a scheme arranged and overseen by Consolidated Fork Truck Serice (CFTS) Ltd. A Thorough Examination is a systematic and detailed examination of the lifting equipment to detect any defects that are, or might become, dangerous. For forklift trucks a Thorough Examination is required as soon as the truck is a year old and thereafter annually but may be required more depending on the truck and its use. In long term hire, it is the operating company – not the company supplying the truck – that is responsible for Thorough Examination. In short term hire, both the operating company and the hire company have a responsibility for ensuring that the truck has a current Thorough Examination Report. In second-hand purchase, the buyer is responsible for checking that the truck has a current Thorough Examination Report before using it.If defects are found following the examination of your equipment these must be rectified by repairing or replacing the equipment before a complete Thorough Examination Report is signed off. Health and Safety – your obligation is to keep equipment is kept in a safe working order at all times. There can be expensive consequences if this can not be shown. Equipment will be regularly serviced as per manufacturer’s requirements at a time which suits our customer’s needs. Maintained equipment runs more efficiently, cheaper fuel costs, parts/components last longer. There should be less likelihood of trucks breaking down just when you need them most. All servicing work is carried our as required by our trained engineers, and we keep track of service history for you. There should be no major component failure that could be expensive to repair. A Service Agreement makes sense, saves time and money, protects your investment and increases the resale value. Can we help? Don't hesitate to get in touch with our Service Team.